The Air Jordan 13 (XIII) Retro Low White / Metallic Silver – Obsidian – Orange Flash has a few nicknames, one was the Bobcats, since Michael Jordan purchased partial ownership, and the colors resemble the teams. 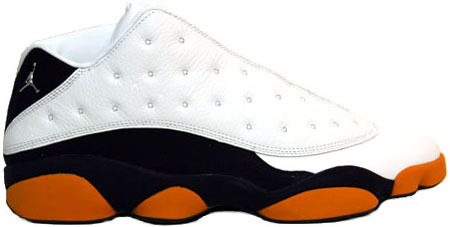 The second nickname for the Air Jordan 13 (XIII) Retro Low White / Metallic Silver – Obsidian – Orange Flash is Syracuse Orangemen, which is the team Carmelo Anthony played for. Since a lifestyle release, matching clothing was available during the release period.